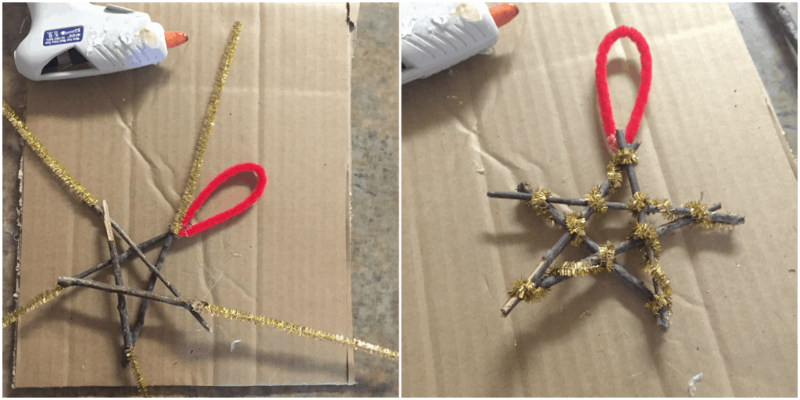 Create a fun nature ornament using sticks. 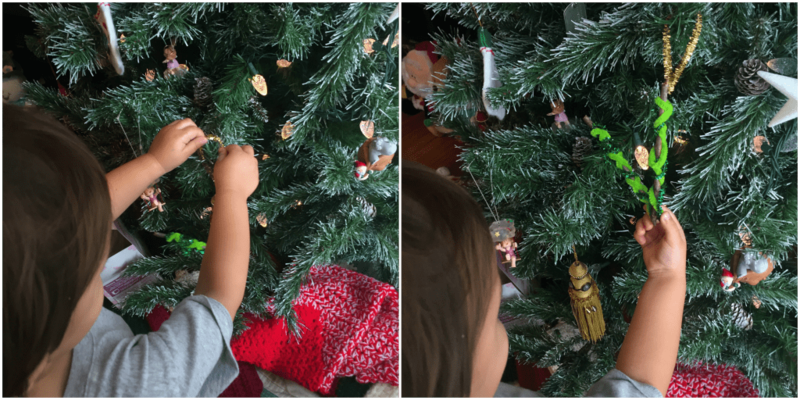 Your kids will love the process from start to finish and they are fun to hang on your Christmas tree. I tend to keep crafting all the way up to Christmas day. Tis the season right?! You know we love nature and of course, we love crafts for kids, so I’m sure the fact that we created this fun Nature Ornament is no surprise! You are going to love making these! I know it might be a little late in the blogging world to put out another Christmas post, but I couldn’t help myself. 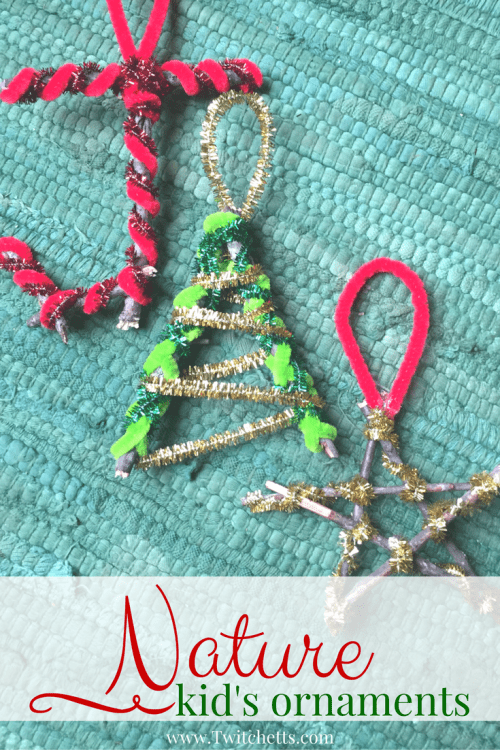 There was no way I could save these fun nature kid’s ornaments we made until next year! There is even a great fine motor toddler activity built in too! 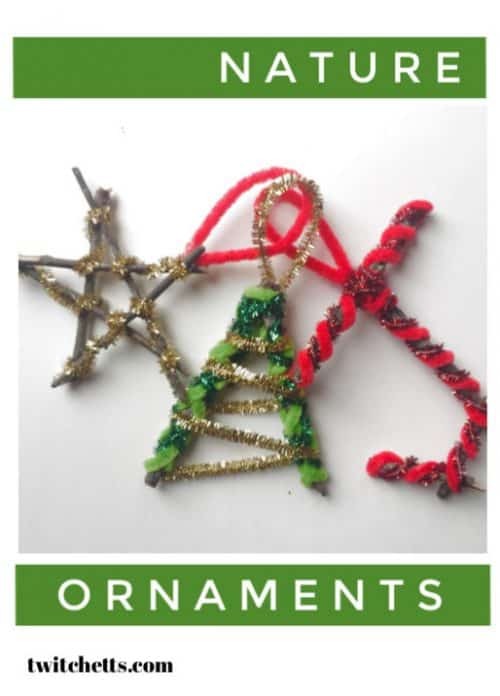 We have already brought you a fun DIY Ornament you can do yourself or with older kids. We have also given you a really fun Ornament for your toddlers to make…This one fits somewhere in the middle! Hot glue, and a glue gun. 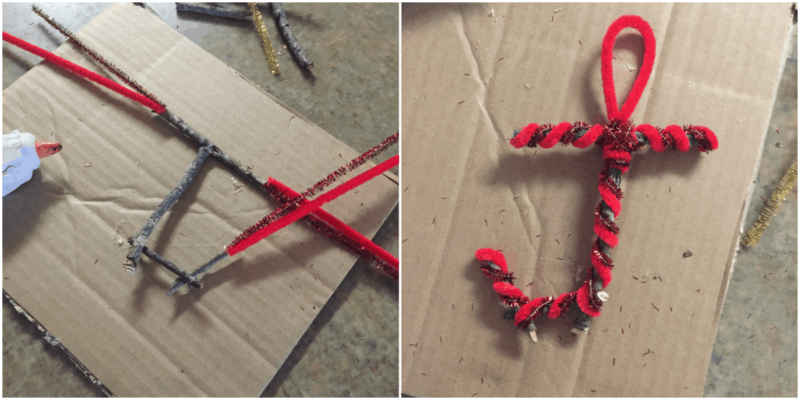 Pipe Cleaners -You can sub in yarn or another style of string. Are you creating a lot of ornaments this year? Grab all your supplies in our Ornaments Amazon shop! Step One: Get Outside!! Send your little ones out to find the perfect sticks for the project. This might take a while so bundle up and enjoy the fresh air! If they are wet let them dry before moving on. Step Two: Pick out what shape you would like to create. We made a J & V, for my kids. We also made a Tree and Star. The tree was a happy accident when we started decorating our V.
Step Three: Glue the sticks into your shape. Play around with your plan. Have some sticks hang over one another. 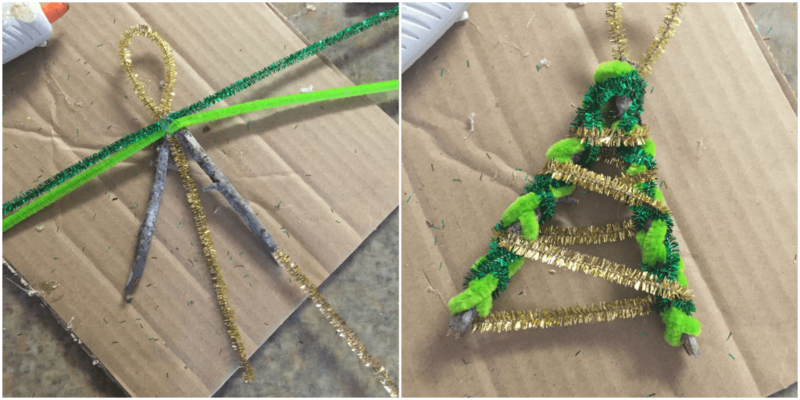 Step Four: Glue the ends of the pipe cleaners to the end of your sticks. Then glue a loop to hang it on the tree when your kids are finished. 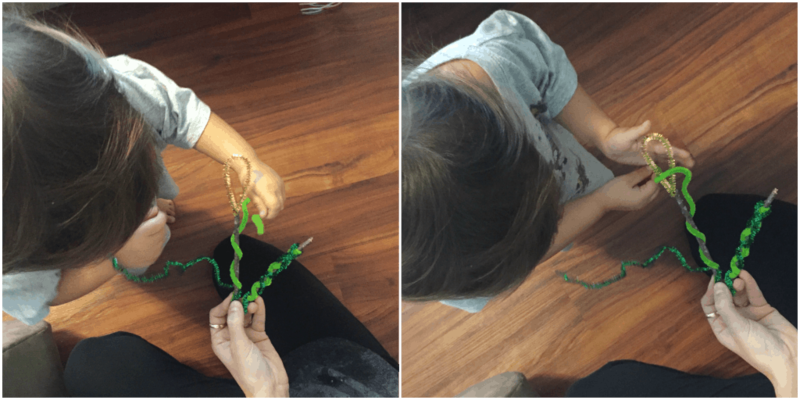 Step Five: Pass the sticks off to your kiddos, let them wrap the pipe cleaner around the sticks however they want! If you have a toddler, encourage them to wrap and unwrap the shape multiple times with the pipe cleaners. 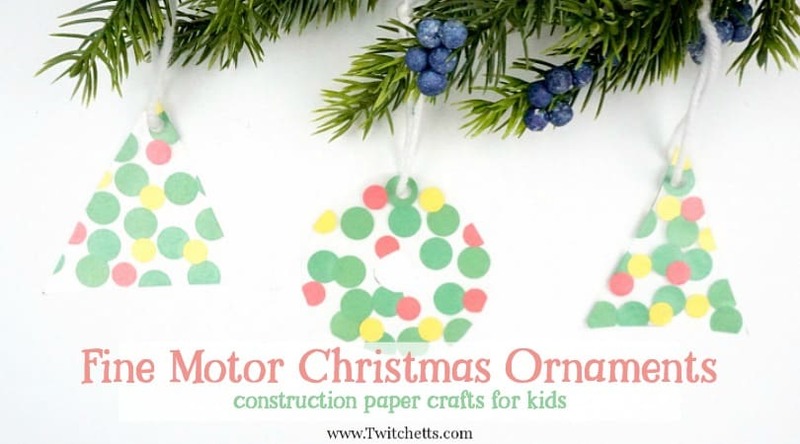 They will increase their fine motor skills and enjoy creating a beautiful ornament they can hang on the tree. Don’t’ forget to pin this handmade Christmas ornament to your favorite Pinterest board!